An excellent post on the excellent blog Sociological Images today pointed out a number of spot-on examples of ways companies assume that men are their standard market, but label products marketed to women as such. For example, you can often choose between a small t-shirt or a women’s small t-shirt; at my long-ago high school, the women’s sports teams were called the Lady Dragons, whereas the men’s teams were just the plain old Dragons. This business of women as irregular afterthoughts is fascinating, but what caught my eye was a bit of the text called out in the bike example. The post includes an excerpt from REI’s website, on which they list the many types of available bikes — mountain bike, road bike, commuter bike …. and women’s bike. These bikes—which can be road, mountain, comfort or hybrid bikes—feature frame geometries, handlebars and wider saddles that are tailored to better fit the typical female body proportion. For instance, the top tube frame lengths on women’s bikes are generally about 1 to 3 centimeters shorter than men’s bikes, so the reach (saddle to handlebar) is shorter and fits most women better. These bikes also feature shorter-reach shifters that better fit women’s hands. Actually, much of this careful description is completely false. 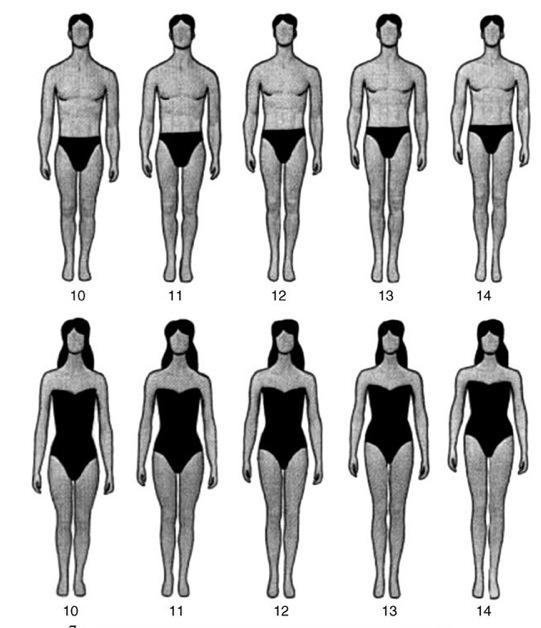 Women tend to be shorter than men, but the proportions of our legs, torsos, arms, and hands is on average the same. There is significant variation in proportion between ethnicities, but I’ve (fortunately) yet to see a bike company produce bikes specifically sized for people whose ancestors come from Japan or the northern Andes. 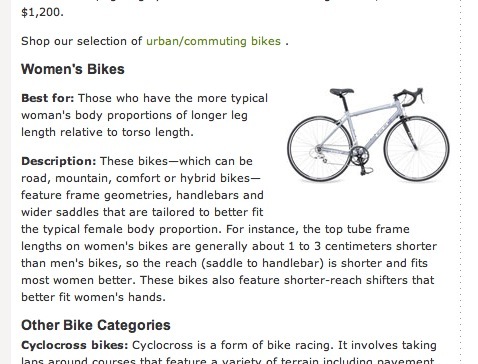 So why would REI (not to mention plenty of other companies, including the quintessential women’s bike makers, Terry) perpetuate this myth of long legged ladies? I think they must just not know — perhaps it makes such intuitive sense to them that it doesn’t occur to anyone to question it, much as it instinctively rubbed me the wrong way when I first encountered it. While there’s no evidence to support that women have proportionately longer legs than men, there is plenty of evidence to show that, in the U.S., at least, people tend to find longer-legged women more attractive, as well as longer-torsoed men. So there you go. No surprise, right? It’s become almost cliched to point out the cultural phenomenon that is Barbie — the doll who, if real, wouldn’t be able to stand up, walk, or menstruate — but I think it’s relevant here. Who knows which came first, the fantasy or the doll, and I’m not suggesting that Barbie played an overt role in mucking up women’s bike fit. But by now, several generations of kids have been raised playing with Barbies. Kids and adults are exposed to tons of images of models and actresses, which often come with instructions about how to look like them, and compensate for your flaws if you don’t. Can we be surprised if most of us, women as well as men, are predisposed to imagine that a typical woman’s body is closer to this fantasy than it really is? Whatever its origin, this myth about women’s bodies may explain, at least in part, why so many smaller women, like myself, have trouble finding bikes that fits us — either the top tube is all up in our business or the reach is too short, or both. The persistence of incorrect standards has likely resulted lot of failed bike quests & painful bike fits among women and men alike. And, to return to the original inspiration for this post, branding a certain fit and styling of bicycle as women-only sets apart “women’s cycling,” whatever that is, as some kind of fringe, limited, and probably not as awesome activity. Anyway, I’m going for a bike ride now — see you out there.